The TPC truck parked outside the EBU’s headquarters in Geneva. The EBU (European Broadcasting Union) is staging a demonstration of an all-IP based OB (Outside Broadcast) truck at its Production Technology Seminar on 29-31 January 2019 in what it claims is a world first. This will feature Swiss broadcast provider TPC’s production truck parked outside the EBU’s Geneva headquarters carrying uncompressed UHD (Ultra HD) signals while supporting data rates up to 100Gb/s. The claim of a world first is confusing given that IP-capable OB trucks have been around several years but is based on the fact that they have mostly so far been hybrid vehicles also supporting baseband SDI (Serial Digital Interface) signals. For example, production systems integrator NEP UK in July 2016 introduced UHD trucks built around Imagine IP3 routers with hybrid IP/base band router infrastructure and design. Such trucks were built for an interim hybrid era where broadcasters would be converting between SDI and IP to exploit the greater economy and flexibility of the latter while working with legacy production equipment. But the end game is all-IP because baseband technology is too bulky, being effectively just point-to-point using copper cable and requiring four paths to move a UHD signal, routed via four quad-HD tiles. Given that space and weight are at a premium in OB trucks, requiring four inputs and outputs for every signal path would be an impediment in the era of UHD. 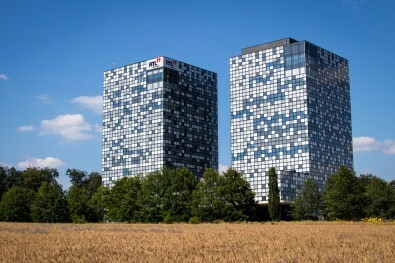 RTL City opened in May 2017. The ground was therefore prepared for all-IP trucks through development of the SMPTE ST 2110 standard suite specifying the carriage, synchronization and description of streams over IP for real-time production, playout and other professional media applications. The SMPTE ST 2110 Professional Media Over Managed IP Networks suite is the major factor contributing towards IP migration in production. It is founded on the Video Services Forum (VSF) Technical Recommendation for Transport of Uncompressed Elementary Stream Media Over IP (TR-03), which VFS made available to SMPTE for the new suite of standards. The TPC OB truck is therefore based on the SMPTE ST 2110 standard which will feature in the EBU demonstrations. However, there are others for which similar claims could be made, such as London-based Timeline’s IP 4K HDR OB truck incorporating an Arista 100G switch and Snell Advanced Media (SAM) IP infrastructure. Then Arena Television, also based in the UK near London, has similarly claimed a world first for its all-IP, SMPTE 2110 compliant, 4K UHD OB fleet.